(Nanowerk News) In 2010 scientists discovered four ‘monster’ sized stars, with the heaviest more than 300 times as massive as our Sun. Despite their incredible luminosity, these exotic objects, located in the giant star cluster R136 in the nearby galaxy the Large Magellanic Cloud; have oddly so far been found nowhere else. Now a group of astronomers at the University of Bonn have a new explanation: the ultramassive stars were created from the merger of lighter stars in tight binary systems. The team present their results in the journal Monthly Notices of the Royal Astronomical Society ("The emergence of super-canonical stars in R136-type star-burst clusters"). The Large Magellanic Cloud (LMC), at a distance of 160000 light years, is the third nearest satellite of the Milky Way galaxy we live in and contains around 10 billion stars. The LMC has many star forming regions, with by far the most active being the 1000 light year diameter ‘Tarantula Nebula’ where the four supermassive stars are found. This cloud of gas and dust is a highly fertile breeding ground of stars in the LMC also known as the "30 Doradus" (30 Dor) complex. Near the centre of 30 Dor is R136, by far the brightest stellar nursery not just in the LMC but in the entire ‘Local Group’ of more than 50 galaxies (including our own) and the site of the perplexing ultramassive stars. 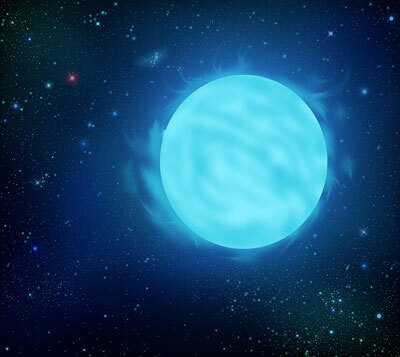 An illustration of the Wolf-Rayet star R136a1, the most massive star known. Until the discovery of these objects in 2010, observations of the Milky Way and other galaxies suggested that the upper limit for stars formed in the present day universe was about 150 times the mass of the Sun. This value represented a universal limit and appeared to apply wherever stars formed. “Not only the upper mass limit but the whole mass ingredient of any newborn assembly of stars appears identical irrespective of the stellar birthplace”, says Prof. Dr Pavel Kroupa of the University of Bonn, a co-author on the new paper. “The star birth process seems to be universal”. The newly discovered four ultrabright ultramassive stars in R136 are quite an exception to this widely accepted limit. Does their discovery mean that the star birth in the 30 Dor region is happening in a very different way from elsewhere in the universe? If so it would challenge the universal nature of the process of star formation, a fundamental premise of modern astronomy. The Bonn group, also including lead investigator Dr Sambaran Banerjee and team member Seungkyung Oh, modelled the interactions between stars in a R136-like cluster. Their computer simulation assembled the model cluster star by star, so as to resemble the real cluster as closely as possible, creating a cluster of more than 170,000 stars packed closely together. At the outset Seungkyung ensured that the stars were all of a normal mass and were distributed in the way expected. To compute how even this relatively basic system changes over time, the model had to solve 510,000 equations many times over. The simulation is complicated by the effect of the nuclear reactions and hence energy released by each star and what happens when two stars happen to collide, a frequent event in such a crowded environment. These highly intensive, star by star calculations are known as ‘direct N-body simulations’ and are the most reliable and accurate way to model clusters of stars. The Bonn researchers used the N-body integration code “NBODY6”, developed primarily by Sverre Aarseth of the Institute of Astronomy in Cambridge and took advantage of the unprecedented hardware acceleration of video-gaming cards installed in otherwise ordinary workstations to fast forward their calculations. “With all these ingredients, our R136 models are the most difficult and intensive N-body calculations ever made", say Pavel and Seungkyung. “Once these calculations were done, it quickly became clear that the ultramassive stars are no mystery”, adds Sambaran. “They start appearing very early in the life of the cluster. With so many massive stars in tight binary pairs, themselves packed closely together, there are frequent random encounters, some of which result in collisions where two stars coalesce into heavier objects. The resulting stars can then quite easily end up being as ultramassive as those seen in R136. “Imagine two bulky stars closely circling each other but where the duo gets pulled apart by the gravitational attraction from their neighbouring stars. If their initially circular orbit is stretched enough, then the stars crash into each other as they pass and make a single ultramassive star”, Sambaran explains. “Although extremely complicated physics is involved when two very massive stars collide, we still find it quite convincing that this explains the monster stars seen in the Tarantula”, says Banerjee.